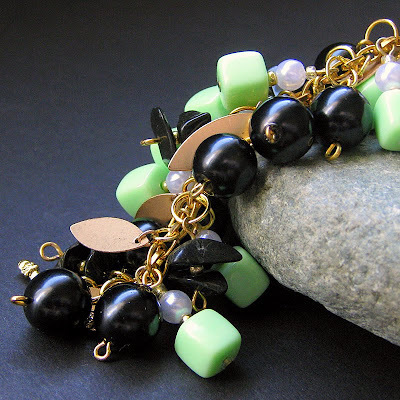 This handcrafted charm bracelet is the true embodiment of spring's warm arrival with bright sprigs of tender green bursting forth out of the inky darkness of winter black beads and stones. The golden glow of both the chain and delicate fluttering leaves interspersed among the beads are a reminder that summer's sun and warmth is on the way. Made from vintage green cube shaped beads, it's guaranteed as a one of a kind piece. The vintage beads are clustered together with glass bead rounds, onyx gemstone chips and delicate gold plated leaves. All brought together in a bright and cheerful cascade on a gold plated chain and matching toggle. Bracelet is 7.5" (19 cm) in length including clasp.